Work is progressing well at our new house, and now that I have a large garden I appreciate the areas that look after themselves. With this in mind I have increased the amount of ornamental woodland planting at the edges of the lawn, ensuring less mowing and giving interest in three layers of planting. As well as cutting down on the mowing, the small woodland areas should help frame the view looking up the garden from the house – we actually didn’t know we had such a fabulous view of the Malverns when we moved in, as the end of the garden had a seven-foot hedge. We cut this back hard during the first winter here and laid the larger branches to thicken up the bottom of the hedge. Hedge laying is hard work but a very rewarding job. The bulk of the growth is removed and cleared back to the main stems; these are then cut near the base but not right through the stem, allowing them to be laid over into the hedge line at an angle of around 45 degrees. This process regenerates the hedge, encouraging it to shoot again from the base, and it works very well with most native hedges, particularly hawthorn and blackthorn. I filled any gaps with dog roses which will scramble up through the structure and provide flowers for the bees and hips for the birds in winter. To accentuate the view further we also added in an old farm gate right in the middle of the hedge; it doesn’t actually open but has the effect of guiding your eye up the garden and out to the view beyond. The woodland area on the left-hand side of the garden was very overgrown and had some large trees, including birch and Scots pine, which had been badly pruned and needed taking out. I’ve replaced these with smaller, ornamental trees to extend the colour and interest – they will also be a more appropriate height for a garden setting. One of my favourites for an ornamental woodland planting is Sorbus, or mountain ash, for flowers in the spring and good autumn colour. I’ve put in the varieties Sorbus hupenhensis ‘Rosea’ for its pink berries in the autumn and wonderful autumn colour and ‘Cashmiriana’ which has white berries. Crataegus (hawthorn) makes a lovely tree; just trim off any branches on the trunk to avoid it becoming overgrown. The variety ‘Paul’s scarlet’ has striking deep pink flowers in spring. I’ve also included Malus sylvestris, the native crab apple, for its lovely blossom and decorative apples in the autumn. In copying a natural woodland structure, these trees form the canopy layer even though they won’t grow as large. For the shrub layer planted underneath I have planted a mixture of hazel; just the native Corylus avellana but you could plant purple hazel if you prefer. I have also added Viburnum plicatum because I love the horizontal branches and white lacy flowers, and viburnum opulus for the lovely autumn colour. The final layer is the woodland floor, which in our native woodland will be a carpet of bluebells and anemones in the spring, thriving in the early sunshine before the leaves appear on the trees and shrubs. It is easy to mimic this effect by using perennials to cover the ground – they need to be plants that like dappled shade and most of them are spring flowering. I’ve included pulmonaria with its spotted leaf and blue flowers, ajuga (or bugle to give it the common name), ‘Catlin’s Giant’ (a good one for large, deep maroon leaves) and geranium pheum alba for white nodding flowers over a carpet of leaves. For some added drama and height I’ve dotted in Solomon’s seal and dicentra, or bleeding heart, with its stunning heart shaped pink flowers dangling on delicate stems. 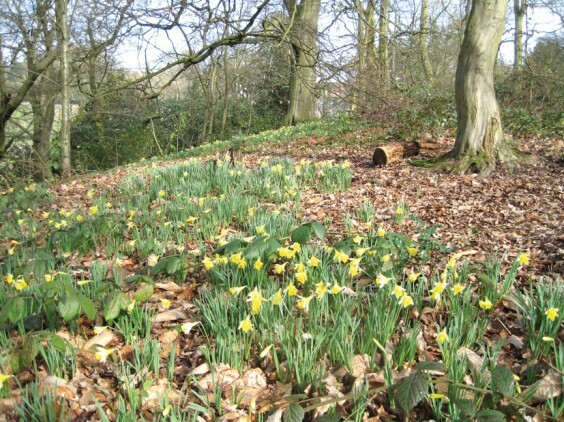 For the lighter areas on the edge of the woodland I’ve planted primroses and cowslips, allowing them to naturalise. The areas of deeper shade will take ferns and hostas. All the leaves should be left in this sort of planting to rot down and add humus to the soil, while simple paths can be created from wood chippings to allow access to see the plants without treading on them. To make the spring flowering even more spectacular I planted about 500 bulbs last autumn: small native daffodils, snowdrops and English bluebells. Now that the hard work of putting this ornamental woodland in is finished, the long-term benefits of a beautiful carpet of spring colour, autumn interest and lower maintenance with less lawn mowing are something to look forward to!